For some, stepping into the cage against a tough opponent is an almost insurmountable task that requires the kind of guts and ability that can only be mustered with weeks of preparation. Jesse McBroom scoffs at that notion. For him, it's all about just getting in there and throwing down - which is what he intends to do on March 15, when he squares off against the New York Fight Exchange's welterweight champ Jerome Mickle at NYFE's "Ides of March" show. 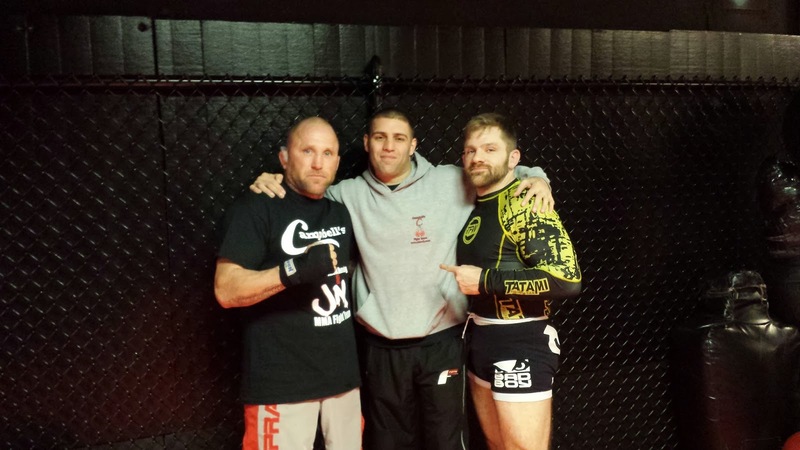 Jesse, who, alongside Bobby Campbell, runs a fight school in Copiague on Long Island, is taking the fight on 10 days notice. That's a testament to both his confidence and the depth of his combative sports resume. 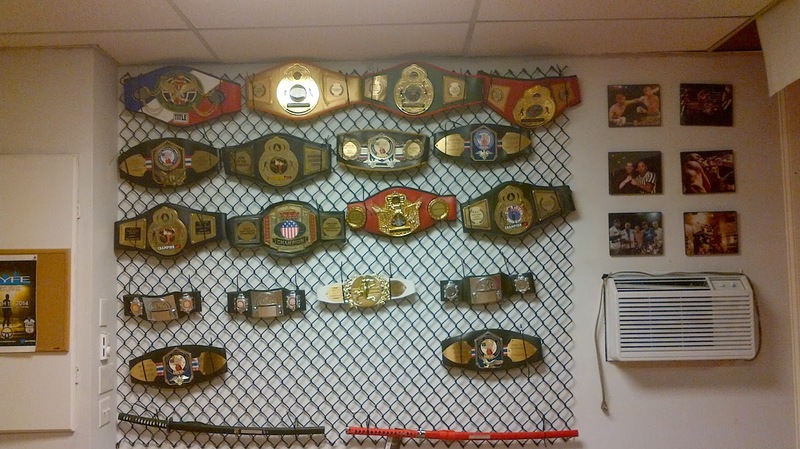 I drive out to Jesse and Bobby's school to interview the NYFE main eventer, and when I arrive, I'm greeted by an impressive wall of shiny hardware. 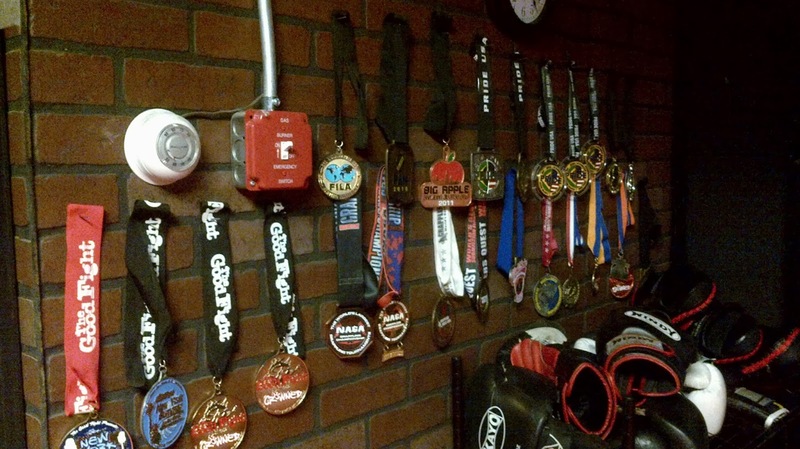 Although Jesse is the proud owner of a jiu-jitsu purple belt under the Serra Brothers, and has a collection of grappling medals to show for it, his journey through the fight world went on to involve an awful lot of success in the kickboxing arena. Mixed martial arts was of course the next logical step - but unlike most, he entered into MMA with a lot of tools already in his toolbox. When Jesse finishes working out, we sit on the mat and talk. I ask why he took the fight against Jerome. "It was a good opportunity for me - main event for the title. I like tough fights and the kid Jerome is good. When I beat him it'll be good for the industry, everybody's going to see that he's beatable. He's a good kid. He's undefeated, I heard. He's got a lot of power in his hands." I've seen Jesse fight a few times, and he's usually got quite a cheering section in the audience. Does having to perform in front of those fans add any pressure? "Not really. I love having the people there, but when it's fight time/'go' time, I really don't concentrate on who's on the outside. I'm more focused on the job I've gotta do. But it's great to have people there behind you - it's awesome. I mean, who doesn't want people there cheering?" The Long Island fighter doesn't seem to be taking the bout lightly, and is respectful of Jerome and what the champ brings into the cage. But when I ask Jesse for a prediction, he doesn't hesitate with his response. "Leaving with the 'W', bro. There's no doubt. I'm looking to either drop him with a punch or get him to the ground and tap him out, show him what a purple belt is about. Know what I'm saying?" What's going to happen on March 15? That's impossible to know for sure. But one thing is certain: the main event between Jerome and Jesse has all the makings of a fantastic fight.